Ancient tradition and modern technology unite for your health, wellbeing, and relaxation in modern infrared saunas. Sauna bathing likely started when prehistoric northern Europeans discovered the comfort of small caverns intensely heated by geothermal sources. The practice still flourishes around the world, from Scandinavia to Japan, typically using hot rocks with the option of adding water for higher humidity. Modern saunas offer an alternative heat source – far infrared radiation, a narrow, safe band of long light wavelengths outside the visible spectrum. True Roots Massage has two Blue Wave infrared sauna rooms comfortable for one or two users. You’ll sweat. It’s good for you. It’s also important to stay hydrated. To build up your sauna time carefully, probably start with 15 minutes. Fifteen-minute sessions in the sauna cost $30, 30 minutes cost $45, and 1 session is free with the purchase of 3. Some users stay for extended sessions. (Check with your doctor if you wonder whether sauna bathing is for you.) 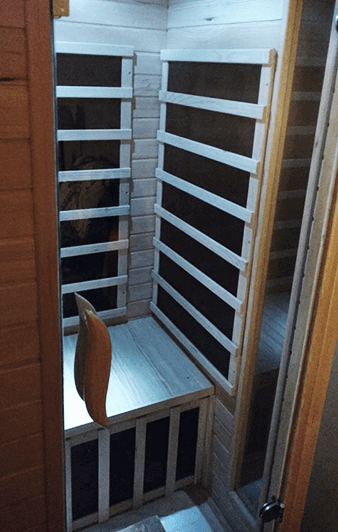 While researchers have noted only trace amounts of toxins in sweat, many sauna users report that the pore-opening sessions make a big difference in their immune systems, energy, and general well-being, in addition to the demonstrated health benefits. Schedule a session now to enjoy a healthy, relaxing sweat!